After being charged with breach of peace for bringing a BB rifle and ammunition to a Representative Town Meeting hearing on gun control in January, Estelle Margolis on Wednesday pleaded guilty in Norwalk Superior Court to a reduced charge of creating a public disturbance. But she maintains that she should have been allowed to address the RTM with her advocacy of stricter gun controls that night. 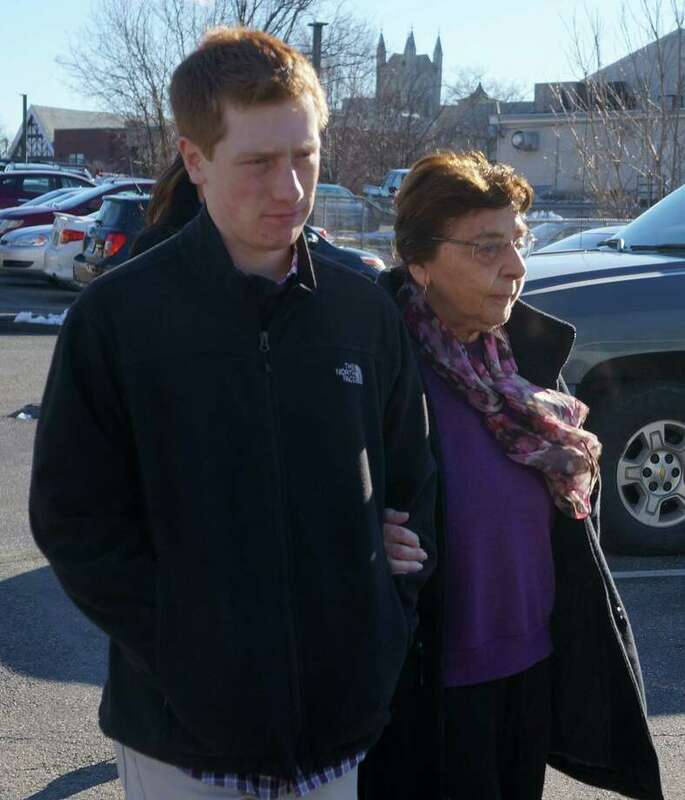 The 86-year-old Margolis' plea to the reduced charge was made following discussions between her lawyer Neal Rogan's office and the State's Attorney's Office, according to Rogan. Margolis will also pay a $50 fine in connection with the plea. In an interview Thursday with the Westport News, Margolis said she was generally pleased with the outcome and praised Rogan. "Neal Rogan was a wonderful criminal lawyer who steered me through this rocky shore, and I arrived in a very good place," she said. "This result is, in essence, less serious than a traffic ticket. I do not think this will have any long-lasting effect on my record." Margolis had pleaded not guilty Jan. 18 to a second-degree breach-of-peace charge in connection with the Jan. 8 incident. She also appeared in court on Feb. 20, but no decision was made during that hearing. She did not give any testimony during Wednesday's court appearance. Known in Westport for her decades of anti-war and civil-rights activism, Margolis brought the firearm, a box of .45-caliber bullets and a box of BB pellets to a Jan. 8 RTM session to highlight the widespread availability of guns in the U.S. The legislative body was debating a citizens' petition calling for support of a national ban on assault weapons and large-capacity ammunition magazines, as well as an end to "gun show loopholes." Margolis bought the gun, pellets and ammunition earlier that day at a Walmart in Norwalk -- her first time buying a firearm. She said she purchased those items with cash and was not asked to show any identification. She also planned to buy ammunition for an AR-15 semi-automatic rifle; all 26 victims of the Dec. 14 shootings at Sandy Hook Elementary School in Newtown were killed with a type of the AR-15, according to State Police. "I asked for the ammunition for the AR-15 gun, and the clerk said, `I'm so sorry, madam, we're all sold out,' " Margolis said. "For me, that may mean that there are many people in our fair county of Fairfield County who own an AR-15. That was very shocking." The BB rifle was spotted by two RTM members and Margolis was escorted from the Town Hall auditorium by police without incident before she had a chance to speak on the gun-control petition. "I deeply regret that I did not get to do what I came there to do," she said. "In essence, the only reason I got any message out to the RTM and general public was because the press took it fairly seriously. I was hoping just to show them what's available at Walmart. The gun is on a rack with toys." Later that night, while Margolis was detained in the Town Hall lobby by Westport police, RTM members voted by a wide margin to support the petition calling for the assault-weapons ban. "I think the mistake I made was to take it [the gun] out of its plastic package," she said. "I was totally unaware I would create such a dustup." Her guns, ammunition and pellets were confiscated by police. They will not be returned to her, according to the court ruling. "I was surprised that I could not retrieve my property at the police station," she said. "That seemed to me an oddball statement. Did they think I was going to do further mischief or that if I possessed a BB gun I had potential to harm somebody?" Margolis said she had planned to make a collage with the gun, ammunition and pellets -- a project she said that she would still like to do. She reiterated Thursday her support for strong gun-control measures, including universal background checks and a federal assault-weapons ban. She acknowledged, however, the challenges of enacting effective gun-violence prevention measures. "I'm not sure if there's any serious way to prevent violence that's being done with guns, except to make sure the people who get them and plan these horrific massacres of little children are caught and dealt with before they do what they plan," she said. "I don't know how you do that. I don't know if there's an answer to that." With her case adjudicated, Margolis said she remains committed to her advocacy. On Feb. 14, she participated in a large anti-gun-violence rally in Hartford. "All of us I'm sure reacted the same way after the Newtown shootings," she added. "You can't not be horrified. You want desperately to do something that will stop that from ever, ever happening again."